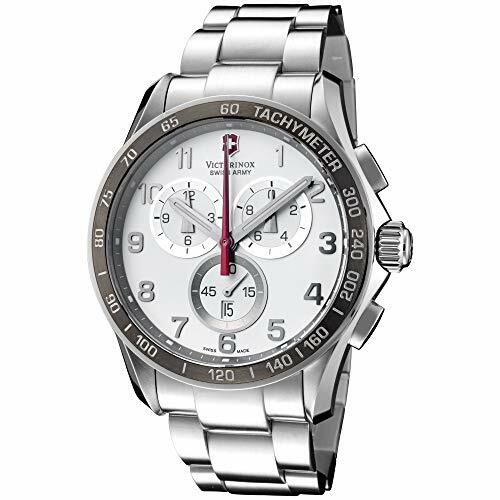 The Victorinox Swiss Army Men’s Chrono Classic XLS Watch #241213 offers a sophisticated look with true chronograph multifunctionality, by offering a four-hand design with three subdials. You get a bold tachymeter scale on the watch’s black stainless steel bezel, split timing, and precision all the way down to tenths of a second, in addition to 60-second and 30-minute counters with Chrono subdials. Other features include a crisp white dial, luminous hour and minute hands, Arabic numeral indexes, and a convenient date window at six o’clock.